It’s true that the weather in Thailand can be variable in September, but if you want to do more than sit by the pool all day it can still be a good month to visit. There are distinct advantages to visiting Thailand during the rainy season with popular tourist attractions less crowded and hotels and guest-houses offering discounted rates. Photos taken in October in Thailand. Clockwise from top: afternoon storm clouds brewing over central Bangkok, a glorious afternoon on Ko Larn (Pattaya), cyclists in front of the Grand Palace on Bangkok Car Free Day. If you are spending a few weeks in Thailand during September, it is almost inevitable that you will encounter heavy rain at some stage during your trip. The September downpours tend to fall in sharp bursts in the afternoon or evening and bring a welcome freshness to the humid air. Although you can expect to encounter some rainy weather, the temperature remains warm and you are likely to see plenty of sunshine and blue skies in between the showers. Naturally, there are no guarantees when it comes to the weather and it is possible that you could experience two consecutive days with rain, but over the course of a 2-week stay you should also enjoy plenty of sunshine too. The waterfalls are more impressive during the rainy season and the surrounding countryside is particularly green and pleasant. 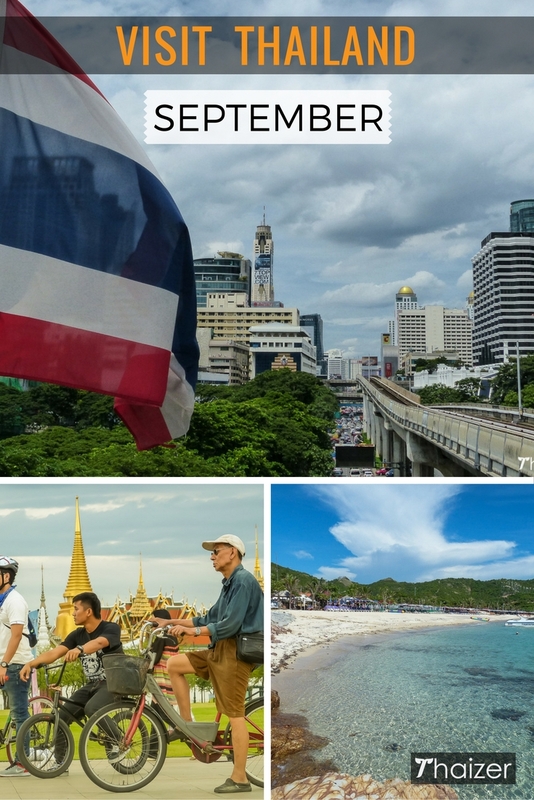 Even if you do have prolonged periods of rain, there is still plenty to see and do in cities like Bangkok and Chiang Mai to keep you occupied. Which is the best Thai island or beach resort to visit in September? I wouldn’t necessarily rule out any particular beach or island, but taking general weather patterns into consideration in Thailand during September, there is statistically less rainfall on the Eastern seaboard or Gulf of Thailand compared to the Andaman Coast. Seas can be rough during the rainy season and September isn’t the ideal month to be island hopping. If you are planning to head to a Thai island for a week in September you may find it more relaxing to base yourself in one location rather than jump from beach to beach or island to island. Ko Samui is a solid option for a Thai island getaway in September. I enjoy staying at Bophut Beach and although the beach itself is average by high Thai standards, it makes a good base with a number of restaurants and quiet bars in the Fisherman’s Village. This is a great place to spend a few hours if the rains do come down. It’s also easy to catch local transport out to other popular beaches such as Chaweng and Lamai. On the mainland, Hua Hin is a good choice for a seaside break within easy reach of Bangkok. A few years ago, I spent time travelling around the Andaman Coast of Thailand during September and October. This coast sees a lot more rainfall compared to the Gulf of Thailand during September-October. I certainly saw plenty of rain on that trip, but it didn’t lessen my enjoyment in anyway. There were fewer tourists around compared to the high season and there were times in Ko Lanta when I had the beach virtually to myself. Further south in Trang, I did experience a couple of days of heavy rain due to a weather system sitting over the area. That was pot luck and generally speaking the rain was restricted to the afternoon or early evening downpours and I still experienced plenty of time with blue skies above. Wherever you choose to stay take into account what else there is to do nearby if the rain does come down. One thing I would recommend during a rainy season beach vacation in Thailand is to spend a bit of extra money to ensure you have a good standard hotel. During the high season when you are spending most of your time on the beach this might not be an issue, but in the rainy season you will welcome a few extra Baht spent on a more spacious hotel room with a balcony and some creature comforts. If a downpour keeps you off the beach, you can always spend a few hours sitting on your balcony or in the comfort of your room with a good book or a cold drink. By the same token, even the smallest resort areas will have local restaurants and coffee shops that can provide respite should the weather turn bad. Mosquitoes can be more of a nuisance than usual during the rainy season and it’s wise to take extra precautions against being bitten. At some beach resorts (such as Phuket), strong currents and riptides can catch people unaware. There are fatalities every year because swimmers ignore the warning flags. Jellyfish can occasionally drift closer to shore during the rainy season months.